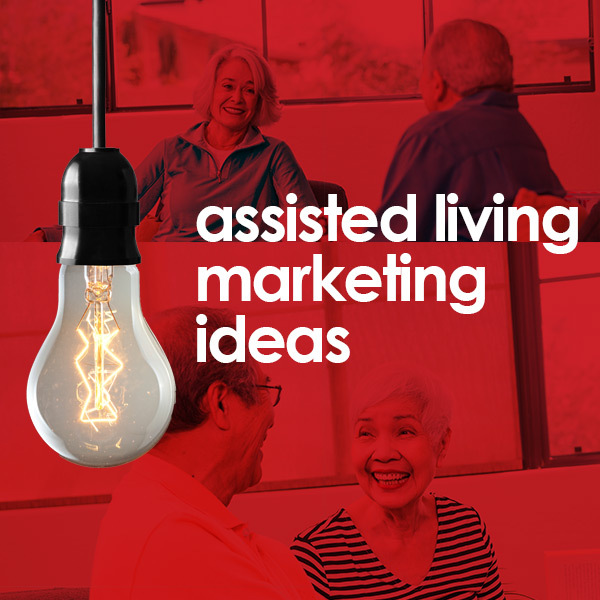 When it comes to assisted living marketing ideas, Epic has you covered. Finding effective marketing strategies for senior living takes time to build, but most importantly strengthen over time. We know what’s important for your senior community… communication. Therefore prioritizing scheduling more tours and attracting more residents to your one-of-a-kind assisted living community. Our digital team attracts the right customers by speaking to the proper audiences across multi-media and highly desired platforms. Don’t take our word for it, these marketing ideas and tips have continued to benefit a few of our senior living clients. Check out this before and after overview of the results our digital team generated for an assisted living community with multiple locations in Southern California (reporting via Google Analytics). It’s not just about having a website, it’s about plugging the right information into the site for an effective senior living marketing strategy. A website is best utilized as the hub of all communications. There are five elements to be addressed prior to starting to developing an online campaign strategy. First, a website must be user-friendly, search and mobile-optimized. Second, visuals aid text. A solid online presence throughout will assure igniting immediate brand recognition. This includes photography that showcases real residents and staff members at your community, refrain from run of the mill stock photography. Third, blogging and hosting events allows brands to speak “with” audiences and not “at” them. Fourth, cohesive branding throughout referral sites such as Google Maps, senior advisor directories and other sites where business listings and reviews are highly sought after. Lastly, social media connects the dots allowing for engagement and transparency for loved ones. First and foremost, before you can do any type of online promotion, you need a hub to drive users to. This hub acts as a marketing tool that works 24/7. Your custom website should not only define your business, but it’s a destination that should be easy to navigate, user-friendly, and mobile-optimized. 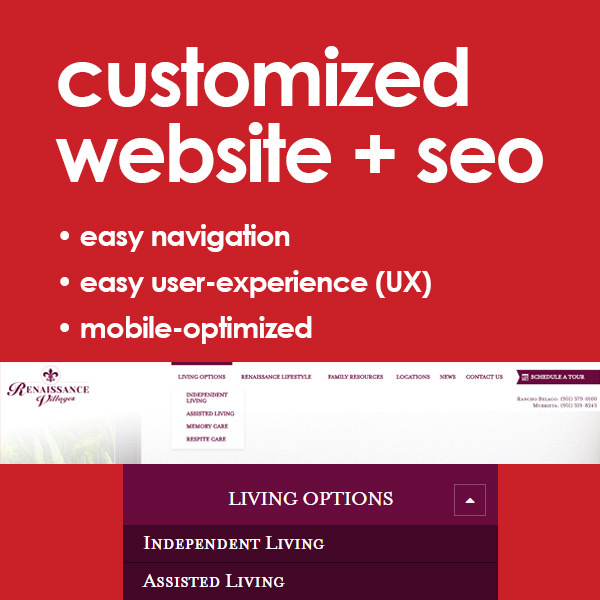 A customized assisted living website developed by professionals is essential in today’s digital age. In addition to having a fully-functioning website that showcases all of your senior living options, implementing an effective SEO strategy is crucial to rank well on search engines. Think about it this way… when a potential resident makes a search on Google for “assisted living options,” the goal is to rank on the first page. When you rank on the first few pages, they can easily find your senior living community and learn more. Sounds easy but it does take extensive keyword and competitive research to develop a game plan that works. Not to mention, search engine optimization isn’t a one and done implementation. It requires constant monitoring and staying on top of the search trends to be ahead of the game, and competitors. 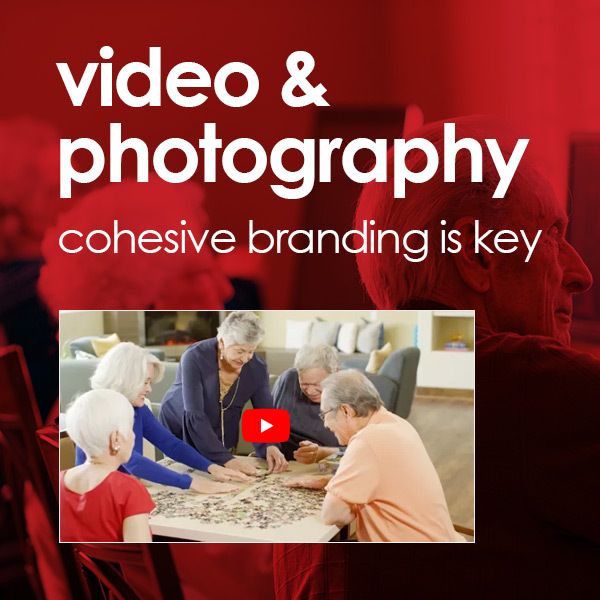 Another important element to developing an assisted living sales and marketing campaign is video and photography. Now that you have a website with an implemented SEO strategy, backing that up with video production services like film content and cohesive photography is key. Stock photography is a thing of the past and residents want to see how your community is different than the competitor. Video and photography does just that. It shows your message in a way that no text is capable of. This content is ideal as it’s useful for website images, YouTube, social media and Google listings. Customers will be able to connect with your brand and community on a personal level. This content should show the many different living options your community has, events and activities, food offerings, and the community morale. Giving residents a glimpse into their new potential home helps in the decision-making process down the line. Are you answering the questions your audience is asking? Blogging is another marketing tactic that allows you to be the expert in your field. By writing blog content that discusses the topics that your audience is interested in allows them to build trust with your brand. Not only instilling trust, but they will turn to your place of business when they have questions, or are looking for a senior care facility. More importantly, blogging goes together with SEO efforts. Curating content based upon search trends allows you to get in front of new customers, and if done right, on the first few pages of Google. 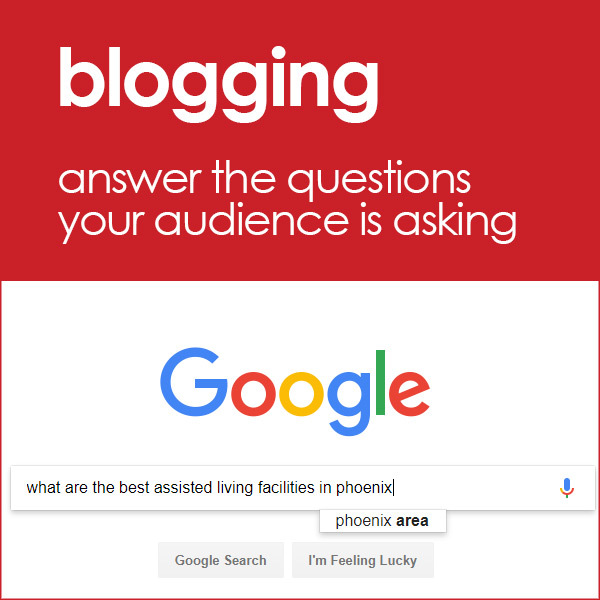 Monthly blogging helps your company leave its mark in the assisted living industry. Not only are you serving them content that they want to learn more about, you are staying consistent and constantly reminding users about your community. Sure, you can sell your business and services all day long, but customers always need a second opinion before making any big decision. Who exactly are they getting those second opinions from? 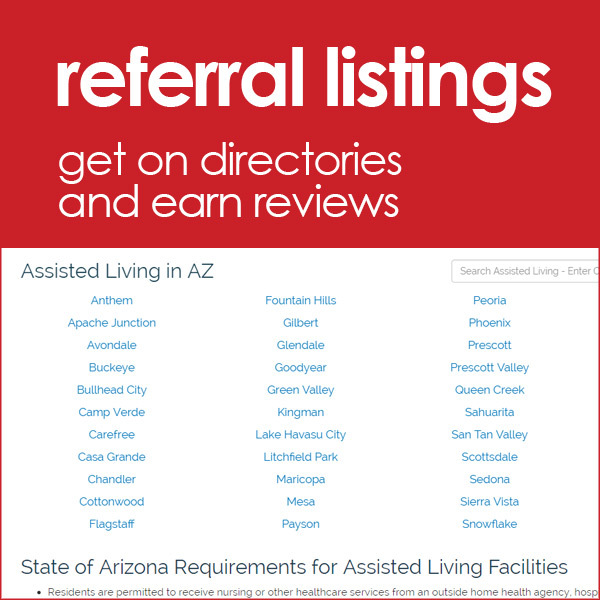 Referral listings and directories! Google, Yelp, and Facebook are all review sites where individuals can share their experiences. 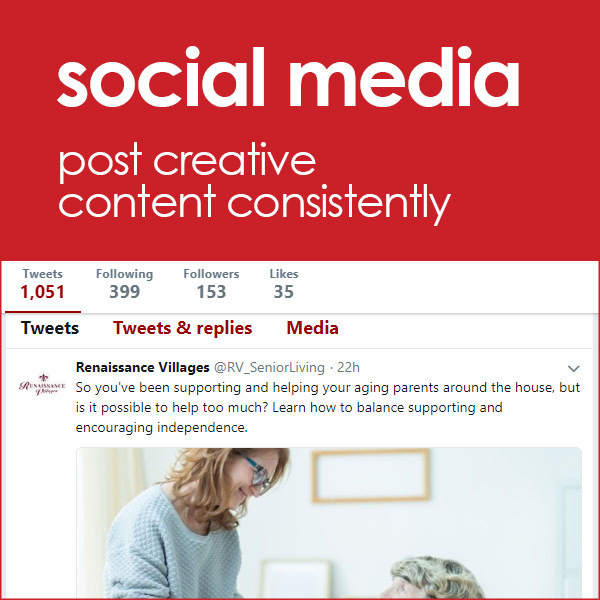 In addition to those social channels, sites like Senior Living, A Place for Mom, and Senior Advisor are all platforms allowing people to share their thoughts. What does this mean for you? It’s crucial to earn honest, real and quality reviews about your senior living community. Too many 5-star ratings might look fishy, so taking measures like paying for reviews is risky. Now, too many 1-star reviews will keep people away, very far away. The best strategy to earning reviews is with an online reputation management system in place. As well as always providing top-notch customer service. These reviews will assist in the decision-making process of residents, and help with your assisted living marketing strategy. When jotting down assisted living marketing ideas, make sure this last one is also on the list. Social media is key to running a successful business. Not only does having social media accounts like Facebook, YouTube, Google+, Twitter, Instagram, etc. help get the word about what is going on at your community, it also helps increase visibility. Social platforms are the best way to keep family members in the loop. Posting photos and videos from events as well as showcasing all the activities going on is a great start. Additionally, using these channels as an outlet for blog content and announcements is another way to drive people to the website. Whether you are looking for assisted living marketing ideas to develop a digital marketing strategy or simply finding ways to promote your community, Epic can help. We have worked with several senior living apartment communities. Most importantly, as a full-service video production company, we are well-versed in developing a cohesive and effective game plan, from start to finish. Need Marketing Strategies for Senior Living?